Why Roman Reigns moved to smackdown live? On this week's smackdown live episode we had seen a most shocking entrance ever on smackdown live. The Big Dog Roman Reigns is now officially a part of smackdown live. 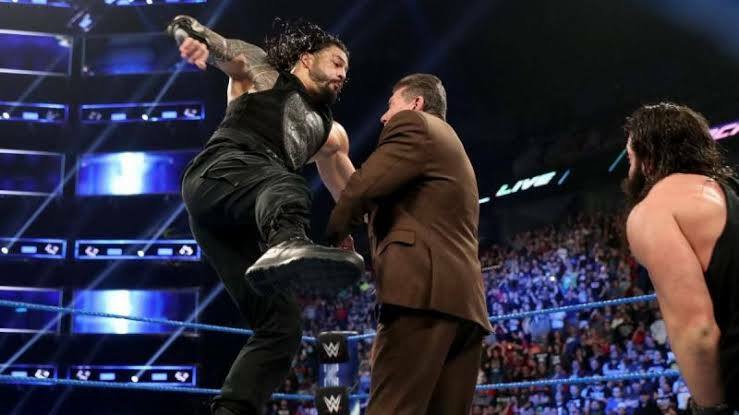 As on this week's smackdown live show we had seen the big Dog attacking Elias and the WWE company's owner Vince McMahon. After his attack, we had seen him saying “Smackdown live is my yard now”. So this move of WWE was really most shocking and unexpectable. After Roman's step to smackdown live, it was questioned that Why Roman Reigns moved to smackdown live? As we had already told you that now WWE company is going to deal smackdown live with the FOX networks. So currently they are preparing Smackdown live for FOX network. They didn't wont to lose the ratings and viewership of smackdown live. And due to this reason only, WWE company had decided superstar shakeup 2019. Where they put the Raw's top superstar Roman Reigns on Smackdown live to bounce its ratings and viewership. Now one is definitely conformed that after Roman's return on smackdown live, WWE company will now give more attention to smackdown live then to Raw. Another reason behind Roman's return to smackdown live could also be that WWE officials didn't wont a match between Roman Reigns and Seth Rollins for the Universal championship. As we all know that Roman Reigns is the top rated superstar of WWE company and at most of the time we had seen him in the top championships storylines only. So as now, currently the top most championship of Raw is with Seth Rollins. And Seth Rollins is a member of the Shield team. So wwe company hadn't expected a good fued for the Universal championship between Seth Rollins and Roman Reigns. Also this match can effect on Roman's image in wwe. As he is a baby face superstar of the company. Let us tell you another reason behind Roman's return to smackdown live could be that WWE company wants new and fresh fued for Roman Reigns. As on raw, almost with all the superstars we had seen Roman's fued but at smackdown live we hadn't seen yet. So possibly in the upcoming smackdown live episode we could see huge storyline build-up of Roman Reigns. So readers.. This was all about in this update. We hope that you liked this update. Let us also know in the comment box below that are you all excited for the next smackdown live episode?
. Bray Wyatt return teased (WWE mysterious box)! So readers.. Are you all excited for the next smackdown live episode?